Chicago, IL, August 30, 2017 – Hotel EMC2, Chicago, received the esteemed AAA Four Diamond Rating. 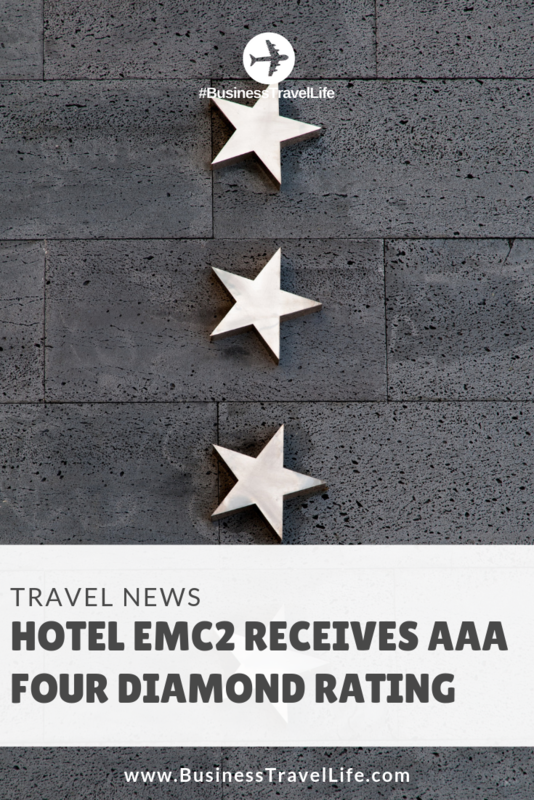 This is the first time Hotel EMC2 has attained this celebrated rating. Hotels at this level are committed to providing every guest with a personalized experience and attentive service in comfortable, high-quality surroundings, according to AAA. They typically offer an extensive array of amenities and guest services. Hotel EMC2 is part of a select group of establishments within North America. Currently, just 1,544 hotels and 689 restaurants hold the AAA Four Diamond Rating. Celebrating the convergence of art and science through its design, cuisine and guest experience, Hotel EMC2, of Autograph Collection Hotels, part of Marriott International, is “exactly like nothing else.” The downtown Chicago property, a vision and passion of Scott Greenberg, President and CEO of SMASHotels, embraces art and science throughout the entire 21-story, 195-room property, beginning with the words of legendary Reniassance man Leonardo da Vinci, “Study the science of art. Study the art of science. Develop your senses – learn how to see. Realize that everything connects to everything else,” that greet guests upon arrival. The hotel is also home to the 120-seat contemporary American restaurant, the Albert, a nod to the extraordinary scientist, which features seasonal, globally inspired dishes from acclaimed Executive Chef Brandon Brumback. Travel Trends: Are Biometric Boarding Passes the Next Business Traveler Perk?